Some Bukharan Jews claim they are the descendents of the ten lost tribes of Israel who were exiled by the Assyrians in the 8th century B.C.E. Whether or not this is the case, the Bukharians can trace their ancestry back to the conquest of Babylonia by Cyrus, the King of Persia, in 539 B.C.E. Cyrus decreed that all Jews in exile were free to return to Jerusalem, though many remained in Persia. The Jews lived peacefully in Persia until 331 B.C.E., when Alexander the Great defeated the Sogdian King Spitamenes and conquered the region. At Alexander's sudden death in 323 B.C.E., the Seleucids gained control, followed by the Parthians, who reestablished the Persian Empire. The Parthians gave the Jews citizenship and allowed them to practice Judaism freely. Under Parthian rule, the Bukharian communities flourished. In 224 A.D., however, the Sassinids conquered the region. They made Zoroastrianism the official religion and persecuted the Jews for their unwillingness to convert. Some Bukharan Jews moved to the northern and eastern parts of the region due to anti-Jewish hostilities. During the spread of Islam in the 7th and 8th centuries, control of Bukhara was transferred between many different Arab rulers. The Saracens overpowered Bukhara in 709 and founded the Umayyad dynasty throughout the former Persian Empire. But the Abbasids, who were Shi'ite Muslims from Baghdad, quickly defeated the Saracens. They maintained control of the region until 874, when the Saminids, who were Sunni Muslims, took over and made Bukhara the capital of their empire. Under the Saminids, the Bukharians found relative peace, which was ended by the conquest of the Qarakhanids in 999. The Jews of Central Asia now found themselves completely cut off from the Jews of Europe, but they managed to maintain some contact with those in the Muslim Empire. In 1219, the Mongols, led by Genghis Khan, conquered Bukhara, pillaging and burning the city to the ground, destroying the Bukharan Jewish community. In 1300, the new leader, Timur, rebuilt Samarkand and Bukhara when the Mongols decided to abandon their traditional nomadic way of life. Timur imported Persian Jews to work as dyers and weavers and develop the empire's textile industry. Supposedly, one could recognize a Bukharan Jew by his purple-dyed hands. In the rebuilt city of Bukhara, the Jews lived in the makhallai yahudiyon, or Jewish quarter in Tajik. The community was restricted to this section of the city, and was strictly forbidden to live elsewhere. Jewish stores had to be one step lower than Muslim ones. Despite these restrictions, Jewish merchants established lucrative trade businesses and the women became known for their elaborate goldthread embroidery. The community also built a magnificent synagogue that was used for the next 500 years. At the beginning of the 1500s, Persia was ruled by Shi'ite Muslims, while Central Asia came under Sunni Uzbeks in 1506. Jews in Persia and Central Asia were divided and ties severed. The isolated Bukharan Jewish community developed its own unique form of Judaism. At the same time, Bukhara had become the center of Jewish activity in the region, especially after a devastating earthquake in 1720 in Samarkand prompted its Jewish population to move to Bukhara. Under the Uzbeks, Turkic nomads from the East, Bukharan Jews experienced waves of relative tolerance and those of discrimination. They were forced to wear yellow and black dress to distinguish themselves from the rest of the population. As non-Muslims, the heads of Jewish households were slapped in the face when they paid their annual tax, a humiliation they endured for centuries. During the mid-18th century, Bukharan Jews were isolated further. The Durrani dynasty created the Afghani kingdom and military conflicts between Bukhara's Manghit dynasty and the Durranis. Due to the continued hostilities, Central Asian Jewry became a distinct entity, named the "Community of Bukharan Jews." Toward the end of the 18th century, the mullahs of Bukhara began to institute forced conversions of the Jews. Converted Jews were called chalas, meaning neither one thing nor the other in Tajik, as they practiced Judaism in secret while posing as Muslims. Both the Muslim and Jewish communities looked down upon the chalas, leading to the creation of a separate anusim community. Hundreds of years of isolation from European Jewry and the forced Islamization of the 1700s, led to a decline in Jewish religious and spiritual activity in Bukhara. The community lacked a strong religious leader until the arrival of Rabbi Joseph Maman Maghribi (or Joseph ben Moses Mamon al-Maghribi) in 1793. A Sephardic Moroccan Jew, Maghribi began a revival of Bukharan religious and spiritual life single-handedly. He introduced Sephardic traditions and prayer to a community who had all but forgotten their Persian rites. Maman recruited European religious teachers to re-educate Bukharan Jews. He founded Hibbat Zion, a precursor to Zionism, and encouraged aliyah to Palestine. Maman served the Bukharan Jews for thirty years, until he died in 1823, having completely transformed the destitute Jewish community. The Jewish population of Bukhara increased in the 19th century, prompting the Muslim authorities to allow Jews to move outside of the Jewish quarter. Jews congregated in the New Mahalla and Amirabad quarters. Jewish quarters were also created in the cities of Marghelan, Samarkand, and Dushanbe. After a mob of Shi'ite fundamentalists burned the Jewish quarter of Meshed, Persia, and forcibly converted the entire Jewish population, a wave of Jews fled to Bukhara. They mostly settled in the Bukharan cities of Shahrisabz and Merv. By 1849, the Bukharan Jewish community was made up of 2,500 families. The Jewish community in every town was led by an elected kalontar. The Jews of Bukhara established a network of Jewish schools called khomlo. Since the emir of Bukhara had forbidden the Jews to build new synagogues, rich families allowed services to be held in their large homes. The Rubinov House Synagogue is one of these makeshift synagogues that still stands today. Tsarist Russia conquered Turkistan in 1868, but Bukhara remained under the Turkic emir for another 50 years. Eventually, Bukhara, Samarkand and several Jewish towns came under the Turkistan region and annexed by the Russian Empire. Initially, the Russians sought the loyalty of the Bukharan Jews as they saw the Jews as their only friend among the newly conquered populations. This friendship was due to years of close trade relations between Jewish and Russian merchants. Russia did not restrict Jewish autonomy and aided the Bukharians in becoming a powerful trading class with Central Asia and the Russian Empire. Simultaneously, the emir of Bukhara continued to subjugate the Jewish population, blaming them for the khanate's fall to the Tsar. Persecution and money extortion led to an exodus of Jews from Bukhara to Samarkand, Tashkent, and other Turkistan cities. In the 1880s, as a result of this mass immigration, combined with growing competition between Jewish and Russian traders and industrialists, Russia began to pass anti-Jewish legislation. Claiming it was solely in the interest of Russian merchants, in 1888, the Russian authorities decreed the expulsion of all Jews from the Trans-Caspian region, encompassing Bukhara and Turkistan. Ironically, the decree was never realized due trade interests with local Jews. In 1887-89, the Russian authorities divided Bukharan Jews in Turkistan into two categories: native Jews and Jews who had moved to the region after the annexation. Natives were allowed equal rights while the rest were labeled as foreign citizens. They were restricted in everyday life and in where they were permitted to live. By 1900, so-called foreign Jews were only allowed to live in Osh, Katta-Qurghan, and Petro-Alexandrovsk. These three border settlements were isolated and undeveloped. Anti-Jewish restrictive laws continued through World War I. Crowd of Bukharan Jews, 1890. The construction of the Trans-Caspian railroad between 1880 and 1905 ended the isolation of Bukharan Jewry. The railroad ran through Samarkand, Bukhara, and Tashkent, linking the three largest Bukharan Jewish communities with the Jews of Europe for the first time in over a millennium. As early as the 1860s, European Jews began to make their way into the Bukharan emirate, and later, the Russian territory. These immigrants were mostly upper class and left their respective countries in the hopes that the government of Central Asia would be less restrictive than that of Eastern Europe under Tsar Alexander III. In 1905, following pogroms in Kiev and Odessa, a flood of Jewish immigrants arrived in the territory. These European Jews were shocked at the primitive lifestyle of Bukharan Jewry. The railroad also enabled Bukharan Jews to begin to make aliyah to Palestine. By 1914, eight percent of Bukhara-born Jews had moved to Rehovot, the Bukharan quarter of Jerusalem. The first aliyah of Bukharan Jews, in which approximately 1,500 left the country, lasted until the outbreak of World War I. The railroad brought with it inexpensive, factory-made textile goods, which drove the prosperous Jewish traders out of business. The Jewish community suffered, and many chose to move to Russian urban centers and assimilate. By the late 19th century, much of the Bukharan Jewish population began to favor a Bolshevik takeover. Centuries of persecution under the local Muslim authorities and then the Russians, combined with the perception that the Soviets would be tolerant of the Jews and bring economic opportunities for trade, led to this support of a coup. These new political views led to even greater persecution under the Muslims. Numerous riots broke out against the Jews from 1918 to 1920. The Bolshevik Revolution of 1917 brought the Red Army to Central Asia in 1920. While the last emir was removed from office, Bukhara maintained relative autonomy under the name of the Bukharan Soviet Peoples' Republic until 1924. At that point, it became part of the Soviet Socialist Republic of Uzbekistan, with Tashkent developing into its major city. Beginning in 1926, OZET, the Soviet organization for settling Jewish workers on farms, established a number of Jewish collective farms, or kolkhozes, in Uzbekistan. By 1929, twenty-six kolkhozes were in existence, but, ultimately, the project failed and only two farming communities remained by the 1950s. After a few years of looking favorably on the Jews for their support of the Soviet takeover, the Stalinist regime began the process of eradicating Judaism, and religion in general, from its empire. Many synagogues were shut down in the 1920s and 1930s, leaving only one shul in each of the large Jewish communities by the 1940s. Practicing Judaism became increasingly difficult. The result of this was that Bukharan Jews were more likely to take advantage of the new Soviet economic and education opportunities rather than fighting to sustain their religion. At the same time, the territory's Jewish population began to grow. The Soviets exiled a group of Jewish Russian dissidents to Uzbekistan. During World War II, large numbers of European Jewish refugees fled to the region, particularly to Tashkent. The European Jews were better educated than the native Bukharan Jews and quickly rose in society. By 1959, though the Tashkent Jewish population had risen to 50,445, Bukhara's Jewish population had dropped to 5,000. The Soviet authorities jailed a number of Jewish leaders in 1936-38, striking a heavy blow at the Jewish community. In 1938-39, the Soviets closed Jewish newspapers and in 1940, discontinued publication of Judeo-Tajik books and shut down Judeo-Bukharan schools. The Communist government did everything it could to smother Jewish culture and force assimilation on the Bukharan community. Beginning in the 1920s, and lasting until the early 1930s, a wave of Central Asian Jews immigrated to Israel, marking the second aliyah of Bukharan Jews. Approximately 4,000 Bukharians left the region, for the most part in secret, due to Soviet anti-immigration regulations. Anti-Semitism was prevalent in the region and the Soviets did little to curb the situation. Blood libels took place in 1926 in Charjui and in 1930 in the village of Aghaliq near Samarkand. After the creation of Israel in 1948, anti-Semitism intensified as Muslims protested throughout the region. By the Six-Day War in 1967, the relationship between Bukharan Jews and Muslims had reached a breaking point, and the Soviet Union became openly anti-Semitic. The government discontinued diplomacy with Israel and forbade Jews to make aliyah. Although these restrictions lasted until the late 1980s, about 8,000 Bukharan Jews managed to immigrate to Israel from 1972 to the first half of 1975. When the Soviet Union collapsed in 1989, the region was split between the newly independent republics of Uzbekistan, Tajikistan, and Kyrgyzstan. Today, approximately 25,000 to 35,000 Jews remain in Uzbekistan, most of whom are Bukharan and reside in the cities of Bukhara, Samarkand, and Tashkent. These Jewish communities are well organized and provide many Jewish activities and communal services. Most Bukharan Jews speak Russian, but some in Bukhara and Samarkand still speak Judeo-Tajik and Hebrew. To this day, however, there is little mixing between the Bukharan and Ashkenazi Jewish communities. Since the creation of the independent Republic of Uzbekistan in 1991, a growing number of Bukharan Jews have left the country due to the rise in Muslim fundamentalism and the poor economy. More than 70,000 Jews have left the country since its inception, and have moved to Israel and the United States. Large Bukharan Jewish populations are located in Jerusalem and Queens, New York. The Jewish community of Bukhara is now around 3,000 and, in Samarkand, there are approximately 2,000 Bukharan Jews. Almost immediately after declaring independence, the Republic of Tajikistan was plunged into a civil war between government forces and Islamic fundamentalists. Continuous military conflicts have kept Tajik Bukharan Jews in severe poverty and in fear of their lives for years, prompting a mass exodus. From 1989 through 2000, 10,800 Jews have made aliyah out of the 20,000 in the country. In 1992, a secret airlift operation brought a small number of Jews to Israel. The approximately 900 remaining Bukharan Jews are for the most part elderly, poverty-stricken and subject to anti-Semitic attacks and persecution. The Joint Distribution Committee, working with community centers and other Jewish organizations, send food packages and try to care for the aged. The Jewish community of Tajikistan is barely able to function and relies on the aid of world Jewish organizations for support. The one remaining synagogue in Tajikistan is located in Dushanbe. In the summer of 2004, however, the Tajik government announced its intent to demolish the 100-year-old structure to make room for a presidential palace. The community of 500 Jews in Dushanbe, most of whom are Bukharan, as well as the world Jewish community, and the U.S. and Israeli embassies in Tajikistan intervened to prevent the destruction of the historic synagogue. On August 31, 1991, Kyrgyzstan declared its independence. Since then, the Jewish community has shrunk due to immigration to Israel. From 1989 to 2001, nearly 5,000 Jews made aliyah, mostly because radical Islamic fundamentalist activity has risen since 1991, especially after the second intifada in Israel in 2000 and the terrorist attacks of September 11 in the United States. These extremist organizations, such as the Islamic Movement of Uzbekistan (IMU) and Hizb ut-Tahrir, backed by other Muslim countries, have been gaining support, have carried out a number of terrorist attacks, and have instigated other military conflicts in the country. In their attempt to make Kyrgyzstan an Islamic fundamentalist nation, the rebels have distributed antireligious and anti-Semitic propaganda. Anti-Semitism has been met with intense opposition by the general public and the Kyrgyz government. The propaganda has infiltrated the population to some extent, however, especially in the isolated southern areas, where Islamic fundamentalism is more active, in Bishkek and the northern regions. Among many Jewish communities in the world there is one that for more than 2,000 years has survived and preserved its religion and national identity in almost total isolation from the rest of world Jewry. Jews of that community have developed their own distinct culture, while at the same time adhering to Jewish principles and hoping some day to return to the Land of Israel. These Jews are called Bukharian Jews. Origins of Bukharian Jews are obscure. No one really knows when first Jews settled in Central Asia. A Bukharian-Jewish legend says that it were Assyrians, who, after conquering Kingdom of Israel (722 BC) deported large part of its population (lost tribes of Israel) to Hador (Bukhara? ), but it is very unlikely that Assyria had any rule over parts of Central Asia. Another version is that first Jews came to Central Asia after it was conquered by Persian Empire (about 520 BC). Persian Empire was a unified state with a well-developed and protected system of roads, and that undoubtedly gave Jews opportunity to spread around the country. Many reasons forced them to immigrate. The Land of Israel was/is very strategically located between the Middle East and Africa, and every time it was conquered (Egyptians, Assyrians, Babylonians, Romans) large parts of its population were deported, exiled and sold to slavery. Some served in the armies of conquerors, while others just left for the search of a good life. In the Persian Empire, outside of Israel, large Jewish communities existed in Babylon, Egypt, Asia Minor and Persia. Suza, the capital of Persia, had a sizable and prosperous Jewish population. Jewish sources are scarce from that period, but we find one from Jewish holiday of Purim. The Book of Esther that is read for that occasion tells about how a Jewish woman becomes a wife of Ahashverosh (Xerxes), king of Persia, and saves Jewish nation from a murderous plot of chief minister Haman. On the day that Jews were to be massacred, Jews all over empire attacked and killed their enemies. The Book of Esther points out that Jews in every satrapy attacked their enemies. So it is possible that Jews already lived in cities of Bactria, Sogdiana and Khorezm. In the later years of the Empire, Jews were for some unknown reasons persecuted and in about 360 BC many were deported to Hyrcania (Gorgan) on the Caspian shore, near the Iranian-Turkmen border. First archeological evidence of Jews in Central Asia goes back to first century BC. In 1954, during excavations in Turkmenistan (Merv, Bairam-Ali), Soviet archeologists found fragments of pottery with Hebrew letters and names. Ancient synagogues were also unearthed. Establishment of Silk Road between China and the West in the second century BC created a new movement of Jews to Central Asia. The term "Central Asia" didn't exist before English and Russians coined it in the 19th century during the Great Game. The region was constantly conquered and different states arouse from there, and parts of it had different names throughout the history. In ancient times it was known as Bactria, Sogdiana, Khorezm, Davan' (Fergana), Margiana, Parthia and Tocharistan. After Arab conquest the general area was known as Maverannahr (Transoxonia) and Khorasan. During Mongol rule it was called Chagatai Ulus. In succeeding centuries parts of it were called Bukhara, Kokand and Khiva. Russians named it Turkestan and now five states control that ancient land: Uzbekistan, Tadjikistan, Turkmenistan, Kyrgyzstan and Kazakhstan. The Silk Road existed for 1600 years until it was superseded by sea travel in late 15th century, and during that time Central Asia experienced its greatest period. Bukhara, Samarkand, Termez, Merv and Urghench became great and prosperous cities. Jews played a great role in development of the Silk Road by engaging in trade. Jewish traders, called Radanites, established trading posts along the Silk Road. Many settled in China itself. In Kaifeng, a city in central China, Jewish community has survived up to the middle of 20th century. They built their synagogue in 1163 and lived in total isolation until being discovered by Christian missioners in 18th century. It is thought that first Jews settled in China around 500 AD, and the only way they could get there was by the way of the Silk Road which went through Central Asia, and there is no doubt that Chinese Jews once were a part of Jews of Central Asia. Up to the Arab conquest, Central Asia had an amalgam of different nations and religions. Buddhism, Hinduism, Zoroastrism, Christianity and Judaism existed side by side. Central Asia was also a safe heaven for persecuted Jews of Iran. Persecution of Jews in neo-Persian Empire (Sassanian Kingdom) began with Yezdigerd III (440-457) and continued during the rein of his son Firuz (458-485). Thousands of Jews were massacred, as was in the case of Jews of Isfahan; Jewish academies in Babylon were closed, and many were killed and expelled. Persecutions continued on and off during the reins of Sassanid kings Kavid and Hormuzd IV. No wonder that when Arabs invaded Persia local Jews welcomed the new comers. The Arab conquests brought about 90 percent of world's Jewry under their rule. As non-Moslems, Jews were considered "ahl al-dhimma" (the protected people) and their local institutions remained independent. But at the same time discriminatory laws known as the "Terms of Omar" were issued. Jews had to pay special taxes, jizia (the poll-tax) and the kharaj (land-tax), from which Moslems were exempted. Jews were prohibited to wear arms and ride horses, and had to wear clothes different than that of a Moslem. With times new laws were created and some made void, but generally the laws remained the same as in the early Islamic era. The land-tax made it expensive for Jews to engage in agriculture or to own land, so they almost exclusively turned to commerce and crafts. It wasn't long before Jews controlled economies of Moslem countries. Jewish trade connected the Moslem east with the Christian west, and Jewish traders were often used to head delegations to Europe. Jews were engaged in every profitable profession. There were jewelers, money-changers and money-lenders, dyers, tanners, barbers, butchers, shoemakers, blacksmiths and others. Few became court ministers, financiers and surgeons. At that time, a major center of Jewish life in Central Asia was Samarkand. In the 12th century, a great Jewish traveler and explorer Benjamin of Tudela wrote that there were as many as 30,000 Jews in that city. Having been far from the Jewish academies of Iraq, some local Jewish scholars began developing their own views on Judaism. Most notable are two of them: Hivi Albalhi from Balkh, and Menachem of Ghazni. They disagreed on some aspects of Judaism with academicians in Iraq. Also should be noted that there were some conversions to Islam and intermarriage with local people. Mongol invasion in the 13th century and succeeding wars hit hard on Jews of Central Asia, but with the coming to power of Timur or Tamerlane a new period for Jews began. Samarkand, his new capital was still feeling the effects of destruction brought on it by the Mongols so Timur needed skilled craftsmen to rebuild the city and make it a world jewel. From every country that he conquered skilled people were brought and settled in Samarkand. A Bukharian-Jewish legend tells that when Timur conquered Bukhara he took few hundred Jewish families and settled them in Samarkand. Those Jews were given a land to settle on and Timur called the community "Bukharian". Subsequently all Jews in Central Asia became known as Bukharian Jews. The Empire of Timur proved to be unstable and fell apart soon after his death. In the beginning of the 16th century Central Asia was invaded and conquered by nomadic Uzbek tribes who established strict observance of Islam and Central Asia fell into Dark Age of religious fundamentalism. At the same time the Silk Road lost its importance and soon was lost in sand. Trade had declined and science was forgotten. All this had negative impact on development in Central Asia for the next 300 years. The events had impacted Bukharian Jews as well. Confined to their own city-quarters they were denied basic rights and many were forced to convert to Islam. Bukharian Jews who continued to practice Judaism in secret became known as "chala". Neither Jews nor Moslems married the "converts" and their lives were often hard. By the middle of the 18th century Bukharian-Jewish communities were in a very bad shape and their existence was threatened. Few Bukharian-Jewish writers, such as Yusuf Yahudi and Ibraghim Ibn Abjil Gheir reflect the hard times in their literary works. The works were written in Bukharian dialect of Tajik/Farsi language. The Bukharian dialect was developed and used by Central Asian Jews. The dialect is a mix of Farsi with Hebrew and, recently, Russian and English. It is written in Hebrew or Cyrillic letters. Some linguists consider it a separate language. By the middle of the 18th century practically all of Bukharian Jews lived in Bukharian Emirate. Cities with major Jewish populations were Bukhara, Samarkand and Shahrisabs. The rest lived in towns of Zeravshan River valley. Few also lived in Tashkent and Ferghana Valley. From the late seventeen-hundreds Bukharian-Jewish population began to grow as a result of a natural growth and immigration of Jews from Afghanistan, Iran, Turkey, Palestine and even Yemen to Central Asia. Forced conversions and massacres in Meshed in the first half of 19th century made many Jews to leave for Bukhara, Samarkand and Ferghana. Same was with the Jews of Herat in 1854, when invading Persians expelled all of them from the city. Before the Russian conquest Bukharian Jews were living in almost every city and town of Central Asia. By 1865 considerable Bukharian-Jewish populations lived in Kermine, Katta-Kurgan, Karshi, Hissar, Dushanbe, Chardjuy, Merv, Tashkent, Khodjent, Kokand, Margelan, Andijan, Namangan, Osh, Chimkent and Turkestan. But the biggest population growth was in Samarkand. Before 1843 Bukharian Jews lived in four parts/quarters of the city, but soon the need was for more land. Emir Nasrullo Bahadur (1826-1860) granted a permission to sell the land for 10,000 silver tenghe. The new quarter was called Mahallai Yahudien (the Jewish Quarter) and exists to this day. For many years from 1837 to 1878 the leader of Jewish community in Samarkand was Moshe Kalantar. A very respected leader he did much for the good of the Jewish community. Almost entire trade and economy of Bukharian Emirate was in the hands of Jews. Some Bukharian Jews served the governments of emirs; one of them, Aroni Kandin served as minister of Finances under emir Muzaffaretdin (1865-1885). Bukharian Jewish traders traveled as far as Russia, Western Europe and Palestine. They were also the first in Central Asia to use Western and Russian made goods and clothes. But this prosperity was just a prelude to riches that lay ahead. Since 1853 Russians were constantly pressing against Central Asian Khanates and in 1865 they took Tashkent. Eight Bukharian Jews took part in a ceremony of official annexation of Tashkent to Russia. Seeing the Russians as their liberators from the tyranny of emir the Bukharian Jews in many ways helped the Russians to advance. 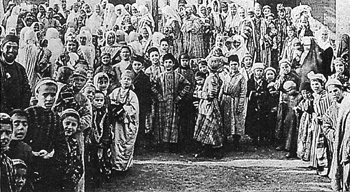 When a Russian garrison in Samarkand was surrounded (1868) many Jews joined the Russians and supplied them with food and water. After his defeat the emir was forced to pay a huge indemnity to the victors, and the small community of Bukharian Jews paid a very large percent of it. The conquest of Central Asia had a big impact on lives of ordinary Jews. Now they were freed from constant wars and excessive taxation. On the contrary, lives of those Jews that still lived under the emir continued to be harsh. They still had to tie a special belt around their waist to show that they are Jews, pay huge taxes, and to come to a palace once a year to be beaten twenty times by a stick or to pay one more tax. Many Jews left Bukharian Emirate and moved to Russian held areas: Samarkand, Tashkent, Perovskiy (Kzyl Orda), Kazalinsk, Aulie-Ata (Djambul) and Skobelev (Ferghana). The large influx of Jews to now newly created Turkestan Region made Russian authorities to worry, and they ordered expulsion of unregistered Jews from some cities. In many cases Jews had paid off the officials and the order wasn't implemented. In general, though, the Russian authorities were more respectful to Bukharian Jews than to European Jews. Bukharian-Jewish merchants quickly proved to be trustful servants of Russian tsar and few were made his sole representatives in some cities of Central Asia. Moshe Mullokandov (1839-1902), who was one of the richest man in Samarkand was a representative of Emperor Alexander II and served as treasurer of Russian Bank in Samarkand. In short time, from 1876 to 1916 dozens of Bukharian Jews became bankers, real-estate developers, merchants of first, second and third guilds, factory, land and hotel owners. Just to list a few of them: Vadyaev brothers, Potelyahov, Dovidov, Mullokandov, Kalantarov, Kalendarev, Pinhasov, Rubinov, Simhayev, Fuzailov, Iglanov and Yagudaev families and dynasties; the new class of capitalists was known around the world, they traveled and had offices in many Russian and western European cities. A cotton factory in Kokand built by the Vadyaev brothers in the beginning of the 20th century was one of the best in the world. Rich Bukharian Jews built and lived in large luxurious homes which after the Russian revolution were used as schools, offices and museums; they are still standing and in use today in Tashkent, Bukhara, Kokand and Samarkand. Of course not all of Bukharian Jews reached such heights. Just a little more than thirty percent of Bukharians were engaged in commerce, the rest were dyers of silk and craftsmen, while the others worked in the factories owned by the rich Bukharian Jews. Before 1917 Jews were free to practice Judaism and practically every family that could afford had their own safer-torah. In every town of Turkestan where Jews had lived there was a synagogue. In Samarkand alone there were dozens of synagogues and religious schools or heder. All Jewish children attended heder where they were taught basics of Judaism and prayers. The religious revival was started by a Sefardi Jew named Haham Yosef ben Moshe Maimon who in the late 18th century traveled to Bukhara and found local Jews in such a bad shape that he settled there, opened Jewish schools and ordered books from abroad. He became a spiritual leader of Bukharian Jews and preached a return to the Holy Land. In the middle of the 19th century Bukharian Jews began to return to the Land of Israel and settle in Jerusalem. There they organized printing in Bukharian language and supplied the books back to Turkestan. Land on which they had settled was called "Bukharian quarter" (Sh'hunat Buhori). It still exists to this day and is well known in Israel because it is populated by ultra-orthodox Jews. Bukharian-Jewish merchants built many luxurious homes there, as well as synagogues; many of them still stand to this day. Outside of Jerusalem Bukharian Jews also settled in Jaffa, Safed and Tiberias. In 1916-17 situation changed dramatically for the Bukharian Jews of Turkestan. The uprising of 1916, in which local Moslem population protested Russian plans to send them to dig trenches on the front, hit hard on many Bukharian businesses and some Jews fell victims of basmachi bandits (the so called "freedom fighters"). The situation was further aggravated by the October Revolution in Russia. Tashkent, Samarkand and many other major cities quickly fell into the hands of Bolsheviks who soon began confiscation and redistribution of property. Years between 1917 and 1922 were the most hard and dangerous. Everything priced was taken from Bukharian Jews: homes, synagogues, jewelry, businesses and factories. Many were arrested on any suspicion and without any legal procedures executed on a spot, leaving large families without fathers, sons and brothers. Some rich and powerful Bukharian Jews were left with nothing. Few were able to hide some jewelry to survive, while others fought to survive with nothing. Unfortunately, some Bukharian Jews fell victims because of treachery of other fellow Jews. At the same time untold numbers of Bukharian Jews fell victim to basmachis, who continued to operate until 1930s. But the most horrible incident happened in March of 1918 in Kermine (Navoi) where a group of Bolshevik soldiers accused local Jews of providing help to counter-revolutionaries and started a pogrom. Many homes and businesses were robbed and destroyed. Then they rounded up and raped more than a dozen women. The incident was a shock to Bukharian Jews who never experienced anything like that before. The pogrom was never mentioned and victims never restituted by the Soviets. In 1920s and 1930s the Soviet policy of atheism, continuing arrests and repressions, especially during the 1930s (Ezhovschina) forced thousands of Bukharian Jews to leave for Palestine. With the help of local guides they were transported over the border to Afghanistan and Iran where they waited for months and even years for visas to enter Palestine. Thus, many families were broken apart, with practically no hope of reunification. During the mass repressions of 1930s and 1940s thousands of Bukharian Jews were arrested and sent to Gulag labor camps where untold numbers of them had perished. From the onset of October Revolution the Soviet government began a program to educate mostly illiterate population of Russia. By a decree of Lenin educational facilities were opened in Central Asia, and because of internationalist policy of the Soviet Union at that time Bukharian Jews were allowed to open their own schools of higher education. Before the Revolution Bukharian Jews could only attend religious schools, and it was almost impossible to be admitted into a Russian school, so most of the Jews weren't able to provide education for their children beyond that of a religious school. In 1920s a number of Bukharian Jewish schools were established in Tashkent, Kokand, Samarkand. The most famous of them was the Institute of Education established in the early 1920s in Tashkent. One of the organizers and presidents of it was Rahmin Badalov, who did very much for the education of the Bukharian-Jewish community. Thousands of Bukharian Jews were enrolled in those schools; many of them later became very known scientists, teachers and artists. Bukharian Jews also attended state universities and colleges in cities all over Central Asia. Being able to converse in three languages (Russian, Tajik and Uzbek) many of them were sent to the countryside where they worked as doctors, teachers or served in the local administrations. At the same time dozens of Bukharian-Jewish cultural centers, clubs and theaters were opened. Bukharian Jews were also allowed to publish their own newspapers and journals. Although before 1917 they were publishing newspaper Rachamim, the mass Bukharian Jewish press existed only in the 1920s and 1930s. One of the organizers of the Bukharian-Jewish press at that time was journalist Aron Saidov, after his death a street in Tashkent was named in his honor. Bukharian Jewish newspapers and journals of that time were Roshnoi (Light), Bairoki Mihnat (Banner of Labor), Hayoti Mihnat (Working Life) and Adabiyoti Soveti (Soviet Literature). In 1938 when the Soviet policy became more nationalistic Bukharian Jews were forced to cease all of their cultural activities. Newspapers, theaters and cultural centers were closed. With the creation of two Soviet republics, Uzbekistan in 1924 and Tajikistan in 1929, Bukharian Jews were given an opportunity to serve in their administrations. Avrom Abdurahmanov served as minister of Justice of Uzbekistan, while Iskiyo Yuabov served as the head of the Department of National Minorities of Uzbekistan. Iliya Leviev was a secretary of the Supreme Soviet (Council, Parliament) of Tajikistan. In the 1930s Zina Kuraeva was the only Bukharian Jew ever elected to the post of a deputy of the Supreme Soviet of the USSR; at the same time many other Bukharian Jews served as deputies in the Supreme Soviets of Uzbekistan and Tajikistan. Many served on city councils, while others were bosses of Bukharian-Jewish collective farms. The farms were established by the Soviet government in the 1920s and continued to exist well into the 1940s. Bukharian Jews like any other nationality were obliged to serve in the Red Army. They served in all branches of the military: air and ground forces, navy. Some served in the NKVD (Internal Security Forces). During the WWII Bukharian Jews fought on the Finnish, German and Japanese fronts. Thirty thousand Bukharian Jews fought against Nazi Germany in the Red Army. It is estimated that 10,000 Bukharian Jews were killed in the war. For their heroic actions thousands of them were decorated with medals. At the same time thousands of Bukharian Jews worked on the home front. Many Bukharian Jewish musicians performed for the Soviet soldiers fighting on the front, and to those who were deployed in Iran. During the war years practically all of Bukharian Jewish families took in refugees from occupied territories. Although Central Asian Jews were spared in the WWII, many Bukharian Jews that lived in occupied Europe (France) were sent to concentration camps. In Bukharian Jewish cemeteries in Tashkent, Samarkand and Bukhara there are monuments with the names of those who fell in the war. After the war Bukharian Jews became engaged in every branch of the Soviet economy. They worked in the commerce, as heads of department stores and as traders in bazaars. Many worked as barbers, shoemakers, photographers and jewelers, these professions were practically controlled by the Bukharian Jews. Thousands worked as teachers and scientists in many educational and scientific institutions in all Central Asian republics, as well as in Russia. Bukharian Jewish scientists took part in many researches and discoveries in the fields of agriculture, biology, chemistry, mathematics, medicine and physics. Many worked as doctors and dentists. Bukharian Jews contributed immensely to the industrial and agricultural development of Central Asia: working in the oil and gas industry and by building dams and canals. Among Bukharian Jews there were many actors, artists, composers, dancers, film producers, musicians, poets, writers, painters, sculptors and sportsmen. Many of them were awarded for their works. Very known Bukharian-Jewish poets were Yahiel Akilov and Morduhai Bachaev (Muhib); and Bension Kimyagarov was a very known film producer in Tajikistan. Bukharian Jews also gave many known sportsmen, especially boxers, many of whom won medals for Uzbekistan. Many Bukharian-Jewish artists and singers played in theaters and sang in operas in Tashkent, Samarkand, and Dushanbe, and other cities of Central Asia. Many were awarded the title of People's Artist of Uzbekistan, and of Tajikistan. Other honorific titles were also awarded to Bukharian Jews. It is impossible not to say anything about Bukharian-Jewish music and musicians, and their contribution to peoples of Central Asia. From the ancient times peoples of Central Asia have developed a type of folk music called Shashmakom and Bukharian Jews took a very big part in its development and perfection. Many renowned Bukharian Jews became court musicians of Emirs of Bukhara. Boruch Kalhot (1837-1897) and Levi Babahanov (Levicha) (1873-1926) served in the court of Emir Abdullahan (1885-1910). Levicha was known not only in Central Asia but also in Russia itself where many of his records were sold. After the revolution the musical tradition was continued by such great Bukharian-Jewish singers and musicians as Michoel Mullokandov (who was the first Bukharian Jew to be awarded the title of People's Artist of Uzbekistan), and his brother Gavriel Mullokandov, Michael, Gavriel and Rafoel Tolmasov (all of them People's Artists of Uzbekistan and Tajikistan). Mullokandov and Tolmasov families produced many of Bukharian-Jewish musicians and composers. Other famous singers, musicians and composers were/are: Avrom Tolmasov, Avner Mullokandov, Neriyo Aminov, Suleyman Udakov, Barno Iskhakova, Isak Kataev, Shoista and Levi Mullodjanov, Ezro Malakov, Ilyas Malaev and many others. Two streets in Samarkand are named for Gavriel Mullokandov and Michael Tolmasov. Many Bukharian-Jewish folk and wedding ensembles existed during the Soviet time and many Bukharian Jews were involved in amateur folk organizations. Today in Israel and the USA Bukharian Jews are actively involved in their folk and cultural activities. In early 1953 the so called "Doctor's Plot" against the Soviet leadership put a clout of uncertainty on Jews of the USSR, if Jews were to be deported to Siberia as it was planned, it could have huge consequences on lives of Bukharian Jews. With the death of Stalin in March of 1953 the plan had failed, but the succeeding Soviet governments adopted the policy of unofficial anti-Semitism. Limits were put on admissions of Jews to universities and colleges, and Jews could not hold high posts in governments as they did in the 1920s and 1930s. During the campaign against economic crimes in 1950s and early 1960s hundreds of Bukharian Jews were sentenced to prison terms. Anti-Israeli stance of the Soviets during the Mid East wars was often felt by Bukharian Jews who lived among Moslem population of Central Asia, but in general relations between Bukharian Jews and locals were very cordial and peaceful. At times of celebrations each side would invite the other. Bukharian Jews were very respected and had good relations with Uzbeks during the leadership of Sharaf Rashidov who was the president of Uzbekistan in 1960s and 1970s. When in 1985 Michael Gorbachev instituted policy of Glasnost and Perestroika Bukharian Jews were allowed to open their theaters and cultural centers. At the same time decline in economy and the rise of nationalism in Central Asian republics forced thousands of Bukharian Jews to immigrate to Israel and the West. The immigration continued in even larger numbers after the break up of the USSR and during the Civil War in Tajikistan. Many Bukharian Jews lost their lives in cross-fighting in Tajikistan, and many have left. In Uzbekistan the situation was somewhat better with president Islam Karimov in control, he managed to keep stability but failed in economic reforms. Although Uzbekistan has normal diplomatic relations with Israel and Jews can freely maintain their institutions many still choose to immigrate. The immigration drains professional workforce out of Uzbekistan, thus leaving the republic with poor educational, scientific and economical base. Local employers are constantly harassing Bukharian Jews that still work in Uzbekistan or other Central Asian republics until they quit; the work place is then given to a person of local nationality. It is impossible to say if that is an official policy the government, but the trend unfortunately continues. There are some Bukharian Jews that work in the government of Uzbekistan, mostly holding low level jobs. But it is almost certain that some day even those Bukharian Jews who stayed behind will immigrate. Since the establishment of Israel in 1948 there were three major Bukharian-Jewish alias: first was before Six Day War in 1967, second was in the 1970s and early 1980s and the third began with perestroika under Gorbachev in 1985 and continues to this day. From 1985 tens of thousands of Bukharian Jews have left for Israel and the US. In Israel whole communities of Bukharian Jews came into existence and in some cities they account for a majority of population. One of the cities is Or-Yehuda. Bukharian Jews live mostly in Tell Aviv area, central Israel, Beersheva and Jerusalem. It is estimated that there are more than 100,000 Bukharian Jews in Israel. There are many Bukharian-Jewish theaters and cultural centers in Israel, as well as publishings (Buharskaya Gazeta). Bukharian Jews also serve in the Israeli army and many fell in the Arab-Israeli wars. In the United States and Canada there are some 60,000 Bukharian Jews. Mostly they are concentrated in Queens, New York, where about 50,000 live. Throughout North America they live in New York, New Jersey, Pennsylvania, Connecticut, Atlanta, Boston, Chicago, Cleveland, Denver, Boulder, Los Angeles, Miami, Phoenix, San Diego, San Francisko, Seattle, Toronto and Vancouver. First Bukharian Jews came to the USA in the beginning of the 20th century, but the real immigration didn't start until the 1960s and 1970s. The opening of the Soviet borders after 1985 brought large influx of Bukharian Jews to Queens, NY, and some to Brooklyn. Queens's districts with mostly Bukharian Jewish population are Forest Hills, Rego Park and Briarwood. Bukharian Jews quickly adapted to American life and today there are many Bukharian Jewish businesses in the US and Canada. Many bakeries, restaurants, shops and jewerly stores are owned and operated by Bukharian Jews. Many work in the gold district of Manhattan on 47th street. There are also computer specialists, economists, real estate dealers, photographers, barbers, caterers, doctors, teachers and scientists. Being far from Central Asia Bukharian Jews managed to create many organizations and funds to help those in need and not to let the Bukharian community to assimilate in the American melting pot. A Vaad (council) was created to manage funds and oversee the Bukharian Jewish community in New York. In 1999 a Congress of Bukharian Jews of USA and Canada was convened, the first event of its kind in the long history of Bukharian Jews. Boris Kandov was elected the President of the Congress. Efforts are being made to hold World Bukharian-Jewish Congress with representatives from North America, Israel, Europe and Central Asia in the near future. Its aim is to maintain Bukharian-Jewish identity and to revive their culture. Bukharian Jews continue to maintain ties with the governments of Uzbekistan and Tajikistan, and their ambassadors are often invited to concerts and different events as friends of the community. As the community expanded there was a need for a Bukharian-Jewish press. Today there are numerous journals and newspapers in both Bukharian and Russian languages. They are: Bukharian-Jewish World, Most, Druzhba (Friendship), Umed (Hope), Vos'hod (Sunrise) and others. In the USA the Bukharian Jews were able to open synagogues and religious schools, and to revive religion among themselves. Rabbi Itshak Yeshuva is the spiritual head of Bukharian Jews of America and Canada. Around the globe Bukharian Jews live in Austria, Australia, Germany and Russia (since 1900, mainly in Moscow). Israeli ethnographers estimate that there are more than 200,000 Bukharian Jews in the world. About 10,000 Bukharian Jews still live in the Central Asian region, practically most of them in Uzbekistan (Tashkent, Ferghana, Samarkand and Bukhara). It is obvious that with the immigration of Bukharian Jews Central Asia has lost a part of its culture and unfortunately the process is irreversible. Bukharian Jews didn't built massive monuments nor have they created powerful states, what has left of Bukharian-Jewish past in Central Asia is their contribution to the culture, development and history of the region and its people. 1. Hidoyatov. Moya Rodnaya Istoria. Tashkent, Uzbekistan, 1991. 2. Genrih Gretz. Istoria Evreev Ot Drevneyshih Vremen Do Nastoyaschago. Odessa, 1906. 3. Rena Mullokandova. Dinastia Mullokandovyh. Israel, 1994. 4. Meyer R. Benyaminov. Bukharian Jews. New York, 1992. 5. Encyclopaedia Judaica. New York: Macmillan, 1971-72. 6. Peter Hopkirk. The Great Game: The Struggle for Empire in Central Asia. New York, 1994. 7. Howard M. Sachar. A History of Israel from the rise of Zionism to our time. New York, 1996. Did you know there is bucharian Radio!?! The story of "Binyomin Khudoi-dat"
This is the real Stuff!! !